I find this one particularly amusing because Apple is all about protecting their brand and they want the Samsung Galaxy Tab shut down. Now. Before the Galaxy Tab does the iPad what all the Android phones are doing to the iPhone -- take a bite out of sales like the bite in the Apple logo. Apple claims the products look "practically identical." Considering how much neuroscience Apple has apparently dumped into finding just the right size for a tablet that is pleasing not only to the eye but to the touch, having nearly the exact same proportions could actually violate some kind of "experience" patent. And seeing is believing. 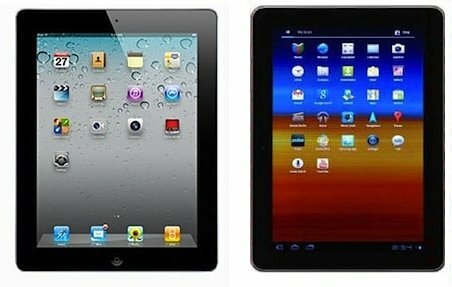 Apple's team submitted the photo and some damning numbers -- the Galaxy Tab was shown to have a 1.36 aspect ratio, ever so close to the 1.30 ratio of the iPad. 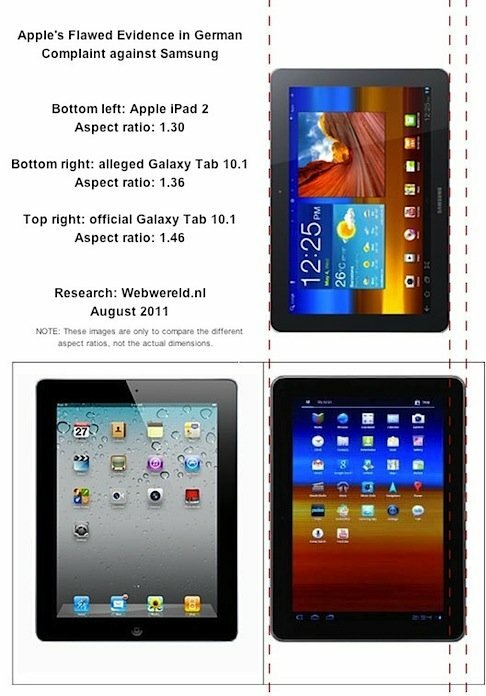 Only, it turns out the Samsung product isn't really that close after all... An article on Dutch website webwereld.nl showed the actual aspect ratios are really quite different. The official Galaxy Tab has an aspect ratio of 1.46, much skinnier than the iPad. Turns out that someone on the Apple team came from Apple's days of desktop publishing and knew a little Photoshop. A little stretch, a little sharpening, put it in the same orientation as the iPad... and they knew enough legalese to make it not quite exactly the same, because that would have been a bit too much to believe.